Uniform and non-uniform clothing items may not be mixed. Official white short-sleeved flat collared shirt with school badge embroidered on pocket, or white short-sleeved collared shirt with official school tie. The shirt must be tucked into the trousers. Official khaki school chino’s with embroidered badge and official school socks, or shorts with embroidered badge and long official school socks. Official dark brown shoes (not suede). Official dark brown pullover or long sleeve jersey (optional). Only official school belt may be worn with the chinos / shorts. White long-sleeved collared shirt with tie. The shirt must be tucked into the trousers. Tie – official school tie. Dark brown and white scarf – official design (optional) [available at school shop]. Dark brown gloves (optional) [available at school shop]. Dark brown blanket – official design (optional) [available at school shop]. A blazer must be worn to and from school. Only official school belt may be worn with brown chino / shorts. Khaki pleated skirt with embroidered badge, or official khaki slacks with embroidered badge (optional). Official white short-sleeved shirt with embroidered badge. Short white socks (no ankle socks). Dark brown shoes with laces or with bar. 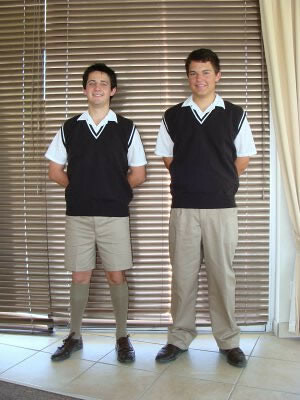 Shirts must be tucked into the skirt / slacks when wearing a short / long sleeved jersey / the matric top when closed. Official white long-sleeved shirt with embroidered badge and tie. Official dark brown winter stockings to be worn with skirt (from school shop) or white socks to be worn with brown slacks. Official dark brown socks can be worn in addition to the stockings (optional, from school shop). Official dark brown pullover or long sleeve jersey. Dark brown and white scarf – official design (optional) [from school shop]. Dark brown gloves (optional) [from school shop]. Dark brown blanket - official design (optional) [from school shop]. Official school brown briefcase with handle and divisions. Official school brown conventional school suitcase. Official school canvas bag with back straps or shoulder strap. No writing (correction fluid / khoki pens) or other markings on the suitcases/briefcases is permitted - only a small identification tag may be attached. In order to provide protection for books, a case/bag should close adequately and have a rigid exterior, or a rigid interior compartment. Cases/bags should be fitted with handles and straps. The official dark brown/green school sports bag. 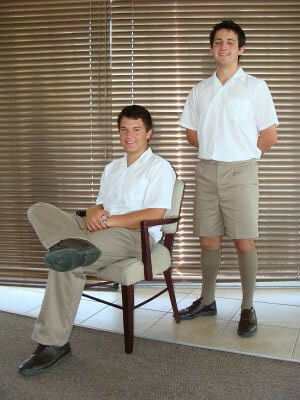 Matric jackets form a part of the school uniform, and subsequently replace blazers at informal assemblies. Matrics must wear blazers at specific day and evening functions set out by the Headmaster or school management team, when on educational visits, or when visiting other schools. 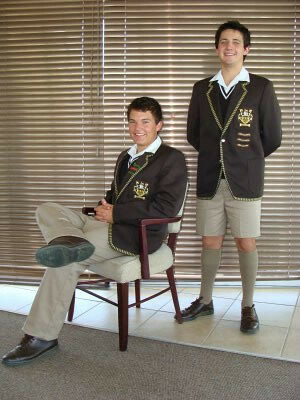 Matrics are also required to wear blazers at formal assemblies (those assemblies at the beginning or end of the term). Tracksuit: Official tracksuit (available from the school shop). Socks: First Team players wear the official first team socks. Tops: First Team players wear the official first team tops. Sport kit for official match days: Only official school tracksuit may be worn, unless sport managers indicate otherwise. PE uniform: Official uniform (green or black shorts, leggings and house or official green T-shirt) must be worn for PE on PE days. All sport clothing will be stocked and sold by the clothing bank at school. All clothing to be marked clearly. Skirts may not be rolled up. Skirt pleats may not be sewn up. Length of skirt must be no shorter than 15 cm above the knee. Socks must be folded over properly - not rolled down or pulled up the leg. Pants / shorts must be worn in the waist. If this is not possible, then the official school belt must be worn. No pants / shorts must hang lower than the waistline. Long sleeve shirts may not be rolled up. Jerseys may not be pulled over hands, and may not have holes in them to stick thumbs through. Jerseys may not be worn around waist or shoulder. Plain white Dri-mac (optional – to be phased out over five years as from 2019) or the official Fairmont green sports jackets (with certain advertising restrictions) [available at school shop]. Shoe laces must be tied properly and not left untied. No fancy adornments or tipex may be on the shoes. No headgear may be worn.